In the Fall of 2014, Rhode Island Latino Arts commissioned local Cuban artist, Ana Flores, to work on an exciting community art installation entitled Café Recuerdos. Café Recuredos is a visual complement to Nuestras Raíces: Latino Oral Histories Project of Rhode Island coordinated by Marta V. Martínez, RILA's Executive Director. The Café Recuerdos project focuses on the popular Latin past-time of drinking café - coffee serves as a memory catalyst for Latin-American immigrants here to remember the community that is absent, and it is also a way of connecting with their new home in America. The project aims to commemorate the Latin American experience, celebrating the hyphenated reality of becoming Latino-American: honoring the past - allá and embracing the present and future here - aquí. The visual component takes the form of a functional peddlers cart with a bottom base made of steel and scrap metal, and the top side walls made from Café Bustelo coffee cans attached together (see illustration above). It measures 30” x 6’ x 6’ and it’s used as a temporary installation both at indoor and outdoor locations. It has narrative on the front wall made of Café Bustelo coffee cans, with the painted likenesses of Latino immigrants in Rhode Island who have been interviewed, plus other Latinos in the state. At each location, we can dispense coffee — the smell of coffee is a way to bring people over to visit us. The cart encourages community engagement in public spaces: we set up a temporary café with bistro chairs and tables, and invite visitors to drink their coffee and share stories with us. Public engagement was also intended to be a part of the process as the artist fabricates the cart. Flores’s intention was to reach out to other community artists, students and fabricators to assist with the construction of the project, while, Martínez engaged young people in the collection of community stories at various local venues including schools, libraries and community organizations statewide. You can contribute to this project! Do you drink Café Bustelo? Do you know anyone who does? We are looking for donations so we can serve hot coffee while the Café travels around the state. Contact us (Send an E-Mail or write a note at the bottom of this page) if you have cans or funds to donate to purchase supplies — coffee, cups, creamer, napkins, etc. 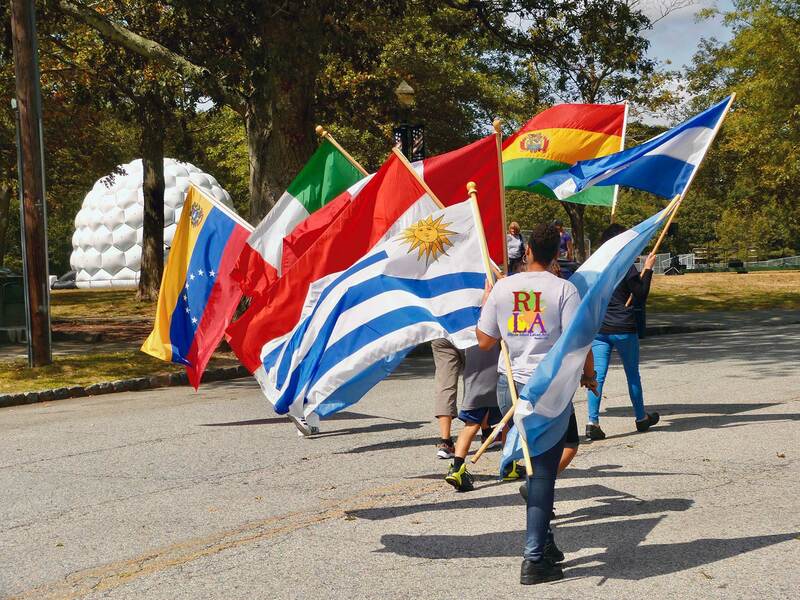 In 2014, RI Latino Arts received a grant rom the Rhode Island Council for the Humanities (RICH) to support an oral history project that was started by RILA Executive Director Marta V. Martínez in 1991. Marta began documenting stories from Rhode Island’s early Latino pioneers, among them: Doña Fefa from the Dominican Republic, who opened the first bodega (Latino market) in the state; Bernardo Chamorro who came to Rhode Island from Colombia in the 1970s; Rev. Francisco Litardo, pastor of Iglesia Baptista Hispana El Calvario, the first Latino Baptist church in Rhode Island, and also in New England; and Victor Mendoza, one of Rhode Island’s early political activists. Marta always felt unsettled because she knew she was missing an important piece of Latino history in Rhode Island: the Cuban story was missing and had a broad impact around the world and the nation when Fidel Castro came to power in the late 195s. With funds from RICH, Marta set out to research and learn about the history of Cuban immigration in Rhode Island. Ana Flores, RILA's Teaching Artist and local sculptor and Tim Ferland, Art Production Manager at the Steel Yard in Providence are seen here putting together a "maquette," or a preliminary sample of the coffee cart that will be used as a model for the Café Recuerdos project. In mid-May, Tim will begin the actual creation of the cart, which will be made of light steel and other scrap metal and canvas. At the same time, Ana will continue painting coffee can with the faces of people that have been interviewed by Marta for Nuestras Raíces. She will then create a wall of the painted cans and will include stories behind each person featured on the can. Stay with us as we continue to document the creation of the cart and watch as the stories unfold. Meredith Youngster of the Steel Yard began work on creating the framework for the coffee cart. Meredith is the Head of Ceramics at the Steel Yard and will be working alongside Tim Ferland and RILA Artist, Ana Flores. Ana stopped by the RILA offices and walked away with over 30 empty Bustelo coffee cans. Within 24 hours she sent us these photos as she began working on creating the walls that will slide into each side of the steel frame of the coffee cart. For inspiration, Ana has read the stories of Rhode Island Latino Pioneers from the Nuestras Raíces, whose faces will be lined side-by-side in bright colors. After reading some of the stories found in the oral history collection, Ana will extract words, memories and will write them on the cans to complete El Muro de los Pioneros, the Wall of Pioneers. The faces on the cans will also include those of Rhode Island DREAMers, immigrant students who were recently recognized at the César Chávez Scholarship reception. The students will have a wall of their own filled with their hopeful faces, thoughts and dreams. There is still much to do. We need more Bustelo cans - donations of full or empty cans will be appreciated. Write us a note below or send us an E-Mail if you have cans to donate. Meredith Youngster drove 24 hours from New Orleans and arrived last night in Providence. For the most part, she said the trip went smoothly until she hit rush hour in Connecticut. Pow! In spite of that, Meredith looked bright-eyed and full of energy when she met us today at Steel Yard. Ana Flores wanted to further measure the coffee cart frame and share her vision with Meredith about the functionality of the cart. It's very important that these two artists talk to make sure things like the height is appropriate, that it's not too heavy to push around and that they both agree on the functionality of the design. Discussing counter space, storage and whether the wheels are 17 or 21 inches high is key to communication between both the artists. Meredith showed Ana a mini mock-up of the cart, which she created from the sketching that she had been provided. Perfect! Ana was thrilled and Meredith smiled back. Twenty minutes later, Jeny Hernández arrived with her camera in tow. She had spent the morning at a wedding in Lowell, MA and jumped into the car right after the celebration, driving just over an hour to meet us at Steel Yard. The excitement and dedication to the project is electrifying and like Meredith, she is thrilled to work on the project. We are happy to have Jeny as part of the Café Recuerdos team. Jeny is of Mexican origin, lives in Providence and is a professional photographer. She will be stopping by Steel Yard to follow Meredith's progress and is especially looking forward to the day she begins the welding process: "The more sparks, the better!" she says as she envisions the next set of photos she will be taking next week. +➤ April 26, 2015: Sparks! Jeny's first meeting with Meredith causes sparks ... big ones, too! Meredith has been working long hours in the studio with Dailen Williams, who assists her every step of the way. The idea for Café Recuerdos came about when Marta V. Martínez, Executive Director of RILA invited local artist, Ana Flores for a cup of coffee as Marta was looking for narrators to interview for her oral history project. After discussions over coffee, Marta realized Ana was not originally from Rhode Island, and therefore did not fit the guidelines of the project. Inspired by the conversation, Ana then proposed of a way that she could incorporate artistic expression into this project made of memories and words. The smell and taste of coffee during that first meeting would later become the inspiration for the theme and title of the project. +➤ May 7, 2015: More sparks. +➤ May 9, 2015: Wheels. A Roof. Voilà! The sides of the card are made out of corrugated metal, found in a scrap yard by Tim Ferlund. They slide into the frame neatly, and poles on all four sides are designed to hold it all together. Bicycle wheels will make the cart mobile. The trick is to make sure all these parts can be easily and quickly put together and taken down by one person, if necessary. +➤ May 12, 2015: Ana Writes . . .
Ana writes: I stopped by the Steel Yard to pick up the cart from Meredith. She had done a great job brainstorming with Tim Ferland how to engineer the portability of the cart and with the help of Dailen Williams, the cart took shape each week. My challenge to them had been: "make the use of the cart – including its set up – a delight for the users." I arrived to see a compact pile of parts that would become the cart, mostly made out of salvaged materials. Recycled materials with a history was also part of the request. Meredith showed me the set up which took about 25 minutes, and then we packed it into my Prius, it fit perfectly with room to spare! Lucas Hearne, Ana’s part time assistant is painting the shelf that will hold the wall of fame. Jeny stops by Ana’s studio and finds her busy at work sketching and painting the cans. Jeny checks in and writes: The cart is coming alive with color! Today, Ana welcomed Marta and Marianne to “Earth Inform Studio,” and first takes us out for a stroll where we get a sense of the beauty and history that inspires her. Part of her property abuts Native American land, including this ancient stone wall which she tells us, was built by slaves in the 1700s. Marta and Ana discuss themes and which artifacts to add to the cart to make the stories richer and more meaningful to each story. And then comes the time to practice taking it down and setting it up. We dismantle it and carry it outside. It’s a bit of a struggle at first, but once we figure out where each pole and panel goes and how to latch on the wheels, it all falls into place. ★ Ana predicts she will done by middle of next week. Yes! +➤ June 10, 2015: Artifacts and a Roof: Almost Done! Jeny visits Ana at her studio and finds her busy at work, finishing up the roof of the cart. Ana mixes colors to get the right shade of blue and also complimentary shades. Artifacts line the shelf of the Wall of Portraits: items that bring back memories to Ana of her homeland, and others that reflect the memories expressed by the Latino Pioneers interviewed for the Latino Oral History Project. ★ Only a few more strokes of paint to the canvas roof, and Ana will be done. +➤ June 24, 2015: Delivered & Done! ★ Today Ana stopped by the RILA offices and installed the canvas roof. What else can we say except … here it is, done! +➤ Sumer & Fall 2015 - Where Have We Been? No wonder we’re tired. Tired, but very satisfied and feeling so energized hearing all the wonderful personal stories of Rhode Islanders - elders & youth, Rhode Island natives & new-comers, Latinos & non-Latinos. We’re grateful that so many people have opened up to us. The cart will continue to travel around Rhode Island starting in early 2016, but with a new name and focus. Plans are underway to take it to Woonsocket, Pawtucket and Central Falls, where we will work with recent ELL immigrant youth. Bilingual workshops and story collecting will focus on teaching students about their local communities and neighborhoods, and helping them find a sense of place in their new homes. Follow us. Stop by as we visit public places. Participate. Share your story. Some of the collected stories have been posted online, on the website of Nuestras Raíces. We lost our roof before the cart arrived at the Knight Library library, but the library staff was gracious and set it up anyway. They also scheduled a coffee hour and talk with Project Director, Marta V. Martínez with Latino students from the Jorge Alvarez High School. +➤ What will happen to the community stories collected through Café Recuerdos? Congressman Langevin greets the crowd at the kick-off reception for Café Recuerdos. Marta V. Martínez, RILA Executive Director and oral historian shows Roberto González, one of the Latino pioneers interviewed for Nuestras Raíces, a section of the cart that shows his image. Our kickoff event on August 15 was well attended and so well received! Congressman Jim Langevin gave welcoming remarks and congratulated RI Latino Arts for being one of 200 recipients nationwide of “Latino Americans: 500 Years,” a competitive grant from the National Endowment for the Humanities (NEH) and the American Library Association (ALA), which provided partial funding for the kickoff event. Artist, Ana Flores gave an inspirational artist talk to the crowd of 45 people and Project Director and RILA ED, Marta V. Martínez provided background about the Nuestras Raíces: Latino Oral History Project. Attendees included members of the arts and humanities community, friends and coffee cart creators from the Steel Yard, staff of the RI Council for the Humanities, fans and supporters of Ana Flores, RILA board members and even some of the Latino Pioneers that were interviewed by Marta for Nuestras Raíces. Do you have a story to tell? Yes! We want to hear from you. Go here, fill out a preliminary form, submit and we will follow up. For an artist talk, contact Ana Flores directly. Funding for the creation and programming for Café Recuerdos has been provided in part by grants from the Rhode Island State Council on the Arts, the Juanita Sánchez Community Fund at the Rhode Island Foundation, the Hassenfeld Foundation, the Taco/White Family Foundation and The City of Providence PopUp Providence Program. The Kick-Off reception for Café Recuerdos was made possible in part with funds from a grant from the National Endowment for the Humanities and the American Library Association.